The CIS football offseason has seen a ton of change already. We'll run down the notable moves and provide commentary when possible. In a rather surprising move, Nill left the University of Calgary for the University of British Columbia. UBC was in need of a coach, firing Shawn Olson after four seasons at the helm of the program. The reason this is a surprise: Calgary was a perennial Vanier Cup contender and consistently produced CFL-level talent, meaning Nill had a relatively easy recruiting pitch. He's had a couple suspensions in his time as the Dinos's head coach, with the most recent issue coming in October 2014. Outside of that, it seemed well and good. Yet, Nill told the Canadian Press that there have been situations that "maybe caused a drain" on him, but UBC has been a CanWest bottom-feeder for a while and turning a program around is no simple (or quick) task. As Neate Sager points out, Nill could make $200,000 annually, and this could have detrimental effects on any attempt towards increasing parity. Sager outlines the problems well, so read his piece (if you haven't already) to learn about the potential problems. In the meantime, Calgary offensive line coach Steve Buratto takes over as the interim head coach. Bertoia, a UW alum, leaves Western to joining a rebuilding Warriors program. The talk around Waterloo is encouraging. 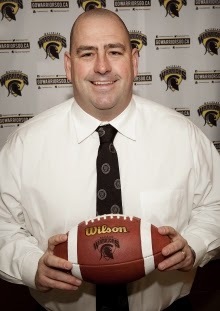 Bertoia says that Waterloo athletic director is committed to the football program. "From the top down everyone is on board," Bertoia told the London Free Press. A Waterloo football revival would be great to see, but don't hold your breath. Until we start seeing some tangible evidence and increased funding, there is little reason to believe that the Warriors will quickly turn things around. Don't get me wrong; Bertoia seems like a great hire and his Western years should give him a great foundation for being a head coach. But rumours about the elimination of a program don't just happen to football teams. There are problems here, but Bertoia seems especially eager to solve them. The Redmen program had a 2014 to forget: they went 0-8 with some ugly losses. The university administration flip-flopped on their stance about Luis-Andres Guimont-Moda's eligibility and drew national media coverage. Their head coach, Clint Uttley, quit because of the administration's view. Now, they need to try and hire someone to coach in the RSEQ conference. That's not a great gig: Montreal and Laval are (obviously) powerhouses with huge wallets. Coaching McGill means that you are fighting an uphill battle, except the hill is 45 degrees and you're wearing roller blades. Their head coaching search is ongoing. Regina needs a new coach after Frank McCrystal's retirement. Jim Mullin of Krown Countdown U confirmed that Paul Dawson (currently the Rams defensive co-ordinator), Jerry Friesen (defensive co-ordinator, UBC), and former Redblacks offensive co-ordinator Mike Gibson interviewed for the gig.